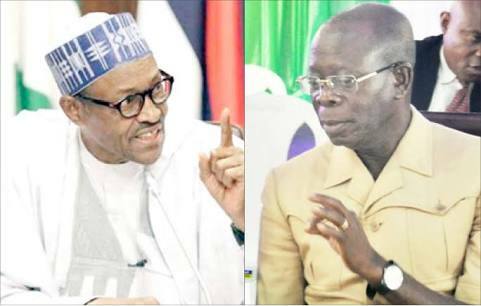 Ambode vs Sanwo-Olu: Oshiomole tells Buhari "We're in Control"
APC National Chairman Adams Oshiomhole was not able to give a clear stand on the controversial Lagos APC primary yesterday after meeting President Muhammadu Buhari. He said the party leadership was in control of the situation. Speaking at the Presidential Villa after a meeting with Buhari, Oshiomhole said: “I told the President that the primaries held as planned and everything is being done to ensure there is no violence because democracy doesn’t flourish with violence. “For me, I’m excited that if we can do it in Lagos, it can be done anywhere. But in Lagos, the Clement Ebri Election Committee said the exercise did not receive its blessing because the conditions prescribed were not followed. Ebri said at about 4.30 pm when he addressed the media that he had contacted the APC national secretariat for further directives. “We are ready to give the state the most credible election. It is not our fault that this exercise took this long. In some states, primary has been moved to Thursday. “We have five persons from the local organising committee and four for each ward. They will all go out to ensure the primary is conducted. We all understand the terrain in the state, especially as it concerns the traffic situation. So, the materials are available now and ready for deployment. “The national secretariat advised us to use ballot papers and we came into Lagos with thousands of them. But during the stakeholders meeting, it became obvious that the state chapter of the party wasn’t ready for such primary. They claimed that there was no time to educate the members and others. And based on the submission made at the stakeholders meeting, some changes were made. “And we were advised to conduct the open ballot in a manner that would be objective to all parties. And that is one of the adjustments we made to accommodate views of the stakeholders. Ebri went on: “Because of the political tension in the state, we decided to be very careful, very methodical and very meticulous in doing it. As party men, peace is very important to us than victory; we want victory that will be celebrated by both parties; we want victory that will be credible; a victory that will be in line with the guidelines and extant rules and laws in this country. We are ready to go to the field and execute this in clinical fashion. “Lagos is a flagship of APC and must continue to remain so for years to come and so in conducting anything that has to do with Lagos, we have to do it with a lot of circumspection and objectivity and it should be a showpiece for the rest of the country." Displaying the result sheets, the Panel Chairman said it was “in impeccable condition and not one single sheet is missing and it is not possible for this committee to do any other thing than it has been instructed to do.